The Inhumanity of it all . . . – All of My Issues! The Inhumanity of it all . . . I would be lying if I didn’t say that the initial trailer made some of us a little skeptical about the new Inhumans show. The one thing that it had saving it for me was the appearance of Lockjaw. This new trailer shows a little bit more of the show. It is also accompanied with an extremely appropriate song. Despite all of this new footage, some are still a little concerned with the portrayal of these characters. When I watched the new trailer, I felt a little bit more comfortable about the show. We actually got to see some powers in action. It seems like the one big complaint many have with the new trailer is Medusa’s hair. Honestly, I don’t think it’s all that bad. Medusa’s hair may not be the best special effects I’ve ever seen, but it is hardly the worst either. In fact, her hair pretty much looks exactly like that in the comic book. Just take a look at this picture . . . If that is the worst thing about the new show, I think it’ll be good. Also, now that the Agents of Shield are in space, it will be interesting to see how they tie all of this together. Regardless of all of the new additions, Lockjaw is still my favorite thing in the new trailer. I think they should probably just have an entire show dedicated to watching Lockjaw. Who doesn’t love a giant teleporting dog with an antenna on its head? 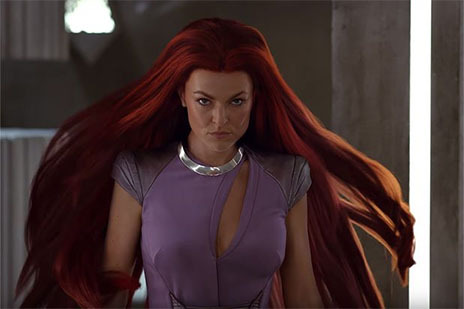 Check out the trailer below and let us know if Medusa’s hair ruins the trailer for you!